I’ve added 50 new printable business cards to FreePrintableBusinessCards.net, and you’ll find an array of designs ranging from formal to whimsical. There are now a whopping 1,458 cards at this site, which I started in 2005, with a free version of each and every design. There are two new styles of monogram business cards individually designed for each letter of the alphabet. One version has the letter in a colored circle on a complementing background color, while the other set has an elegant script letter in black. Other new business cards at FreePrintableBusinessCards.net are for specific business ventures such as: tutors, salespeople, and the beauty supply industry. This site has executive business cards, political business cards, freelancers’ cards and much more. Beyond business cards you’ll find cards for arranging kids’ playdates and save-the-date cards for weddings and other events. FreePrintableBusinessCards.net also has a free photo business card generator and a QR code business card maker. 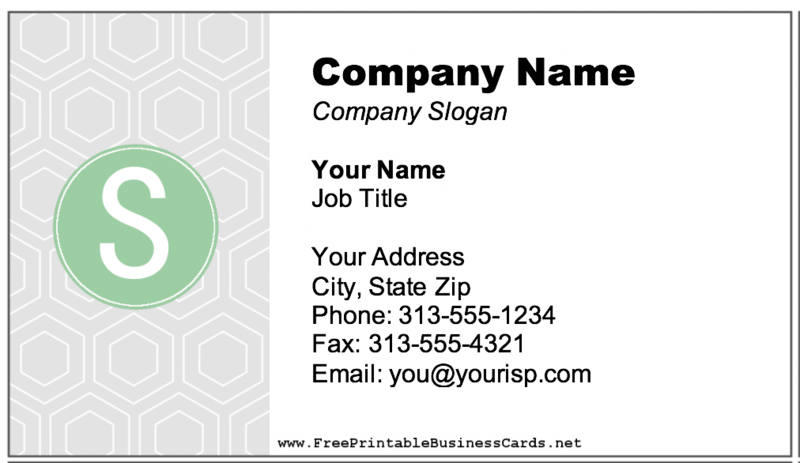 Some of the site’s cards match sample resumes at InstantResumeTemplates.com while others match stationery at FreePrintableStationery.net. You can download, edit and print any business card for free in DOC format with the site URL at the bottom. If you would rather be able to remove the URL, there’s a $3 premium DOC version lets you delete it. There are also a few dozen free, instantly-generated cards that are PDFs with the site URL permanently embedded.